Rooftop Reviews: Happy Valentine's Day - and a Birthday, too! Happy Valentine's Day to my wife of 24 years, Sue. Without her I would walk into walls, sleep in theaters, and sometimes find myself face down in my dinner. Well, maybe I still do, but not quite as often as I would without her in my life. We still annoy one another in small ways, as most married couples do, but we also still enjoy one another. And that is the secret of being in love. And that brings me to my daughter, Sarah. 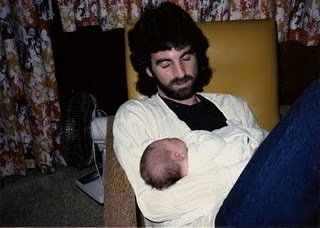 Here I am, holding her at about 3AM in the morning on Valentine's Day 1987, which just so happens to be her birthday. We tend to do things around holiday times. We were married on the Fourth of July, had Sarah on Valentine's Day, and she got married on Halloween. Go figure... But she has bought much joy into our lives, and so I just wanted to wish her a Happy 24th birthday. As I told her last night, "May you never lose direction, and all your horizons lay just beyond your reach. In that way you will always strive to be more." We now return to our regular broadcast.